Students - I must admit that it was rather exciting to pull classic Blue from my box (eyes closed!) yesterday. And in thinking about the poem, my mind went in several directions. I found myself drifting around our young friend's building, considering important building places from times from my own apartment-living experience. The laundry room is an important place, and it is a place where you often meet up with others from your building. 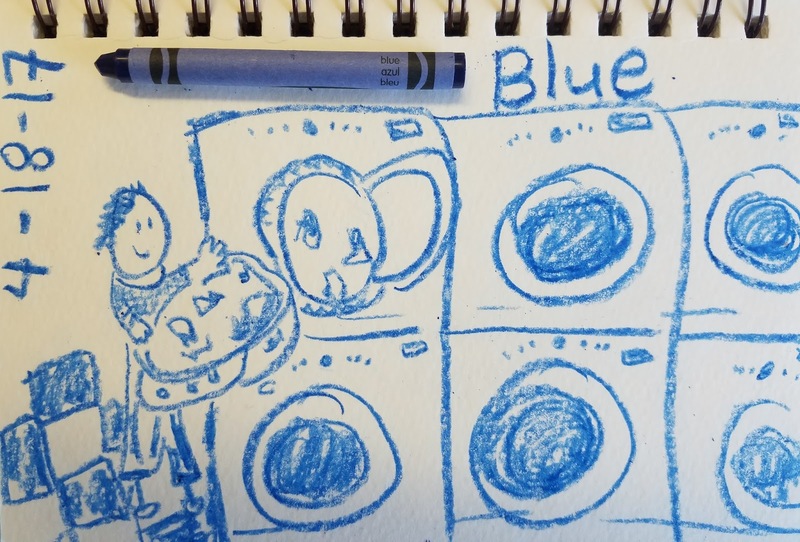 I am personally a laundry hugger, and when I visit schools, I often share my poem Laundry Hugging, so you may know this fact about me. It made me giggle to see this fact show up in yet another little poem. It is true that each of us has themes in our writing, ideas and thoughts that appear again and again. You will only discover these if you write a lot, though, so this is one great reason to keep a notebook. Keeping a notebook over time helps you discover your own themes and recurring thoughts and wonderings and hopes. You might have noticed that some of the clothing items in today's poem connect back to residents of this building. Who do you think owns which items? (I am curious about the wearer of the footie pajamas with googly-eyed owls.) Having these folks rejoin me in new poems here and there has been a joy of this month. Writing is full of surprises around each corner. If you are Writing the Rainbow with me, perhaps your color for today will make you think of a place or a chore or a small tradition or ritual from your life. You'll see! Colors can take us anywhere. And if you'd like to join in with your own poem at our Writing the Rainbow Padlet, please do! It is growing every day, full of ideas and poems by poets of all ages. And please don't miss the links to all kinds of Poetry Month goodness up there in my upper left sidebar. Happy eighteenth day of National Poetry Month! Love how there's a link between some of the clothing and their owners in the building. 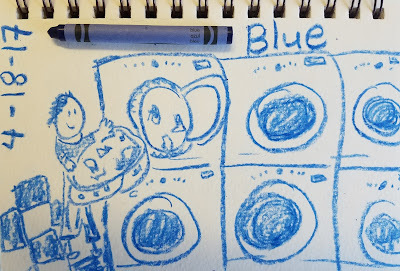 When I saw blue and laundry, I thought of blue feelings. Instead, you've made an outing to the laundry room exciting! Yup. I always hug my towels When they come warm and fluffy from the dryer!